The words came dripping out of Bill Maher's mouth on CNN's Larry King Live. He was mocking the question that Saddleback Pastor Rick Warren asked Barack Obama and John McCain about the presence of evil in a terrorist-filled world. In fact, after Maher said the word evil, he sort of snickered, as if this pseudo-intellectual jerk who was canned from ABC for praising the 9/11 terrorists and condemning our military couldn't even believe he was wasting his time on such a nonsensical concept as the struggle between good and evil. And so it goes during another night of prime time national TV coverage of this remarkable campaign season. It was another full hour of bashing John McCain, George W. Bush, Ronald Reagan, conservatism, Christians, and any organized religion on the showcase chat program on CNN. The week before, Larry King featured Jerome Corsi, the author of the #1 bestselling book in America, "The Obama Nation", the book that delivers a side of Sen. Obama he and his followers definitely don't want us to see. Did Dr. Corsi receive a full hour of uninterrupted airtime like that disgraceful little man, Bill Maher? Not on your life. CNN's classy move was to have some toady from "Media Matters", the George Soros-funded anti-conservative website, alongside Corsi to badger, interrupt, challenge and basically try and shout down everything Corsi had to say. Larry King and his producers ought to go back to school and learn what fair and balanced really means. For Barack Obama supporters, the stakes are high. Their candidate just had his clock cleaned by McCain at the Saddleback Church forum. Anyone who bothered to watch saw a seismic difference between the two candidates, a true display of wisdom, warmth, experience and moral clarity versus a waffling, Oprah-esque lightweight who seemed positively lost without his trusty TelePrompTer. 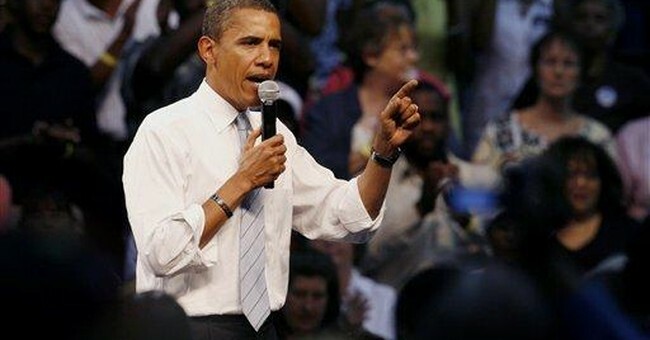 Following Obama's disastrous appearance at Rick Warren's church, the Obama machine (i.e. mainstream media) had to leap into action. Step one: virtually ignore the substance of what the two men said and, if bothering to cover the event at all, glom onto some idiotic non-issue like whether or not Sen. McCain was actually in a "cone of silence (surely this was the first ever attempt at a serious debate over a "Get Smart" reference)." Step two: Dispatch the pit bull dogs of the radical left like Bill Maher to prime time TV shows like Larry King Live and make sure they get at least an hour of uninterrupted, unchallenged airtime in order to desperately prop up Sen. Obama and smear anything or anybody who would be willing to come within a thousand miles of a Republican. And lastly, pray that no one is noticing that Obama's lead in the polls is slip-sliding away, slowly but surely eroding. I think that last check is in doubt. The Obama camp has to know that anyone who can't hold a commanding lead in the polls after the love affair the media has had with him might just not be winning material. It reminds me of the media infatuation with Air America, the so-called liberal talk radio network. Al Franken's picture was plastered on the front pages of magazines and newspapers everywhere after the network was launched, ostensibly as a way to counter the success those of us in conservative talk radio have had. Millions and millions of dollars worth of free publicity was given to Air America by a fawning, lapdog news media desperate to see folks like Rush, Sean, Mike, Glenn and the rest of us conquered by the lefties. Where is Air America today? After bankruptcies and bounced checks and repossessed furniture, I hear they're still trying to make a go of it. Barely. The public can't be fooled all the time. Like Judge Judy once said, you can't pee on someone's leg and pretend that it's raining. Most sensible Americans know a con job when they see one. Air America has tanked because it features a bunch of talentless, angry demagogues who wouldn't know how to entertain a radio audience if their lives depended on it. And Sen. Barack Obama is failing because he just can't figure out how to pretend to be the moderate, middle-of-the-road "uniter" that just wants change the way a beautiful morning snow transforms the countryside into a peaceful work of art. No, the radical community organizer from Chicago scares people. And we're not afraid of his heritage or his name or even his former pastor. We're terrified that a man who wants to redistribute wealth, continue with late-term partial birth abortions, tax us to death, and not even have the God-given sense to cite Islamic extremist terrorists as an example of evil when asked is about to officially accept the Democratic nomination for President of these United States. This is John McCain's race to lose. And he needs to be careful. He shouldn't have been surprised at someone asking him how many homes he and Cindy McCain own. The left loves to demonize the financially successful. There'll be more of this to come. And so Sen. McCain better have all his ducks in a row. Despite the fact that Obama lives in a big, beautiful house facilitated by a crook, he has taken delight at ridiculing McCain's inability to answer a simple question about the amount of homes he has. And frankly, I can't blame him. Never mind that the difference between McCain's wealth and Obama's is that there's an absence of hypocrisy in the Republican's economic story. As he put it at Saddleback, he wants everybody to be rich. He'd love to see all Americans achieve prosperity. It used to be called the American Dream. But to liberals who fly around on private jets and feast on caviar, attacking wealthy Americans has become a blood sport. I think John McCain is up to the challenge. When he says he's going to pick a running mate who "shares" his values, I believe him. C'mon, Sen. McCain, don't pick a pro-abortion politician. Your base has enough worries about your conservative bona fides, we don't want to fret over you running with someone on the same page with Obama on the life issue. I initially expressed indifference to Sen. McCain's running mate being pro-abortion. But my radio listeners changed my mind. The presidential election has to be about energizing the base, mobilizing the voters, and making us excited to pull the level for the Republican candidate. This weekend, I leave for Denver where I'll be blogging and broadcasting from the Pepsi Center, site of the Democrat National Convention. As I like to say, I'll feel like Van Helsing entering Castle Dracula. As I appear on Fox News, perhaps I'll wear garlic around my neck. It should get a chuckle out of the 'Fox and Friends' crew. But let's face it, this is no laughing matter. Now begins the serious process of getting down to business and keeping the country out of the hands of radicals.